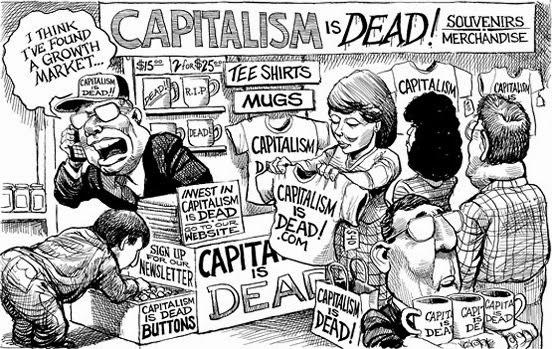 Capitalism is dead. It isn't apparent yet, because it is still shambling around like the zombie it is, but for all of that it is dead. Really in the end, it was the victim of its own success. It survived for centuries, outlasting revolutions, adversarial paradigms and even outright attempts to stack the deck in the system. The one thing it cannot survive, however is automation. I know that seems like an odd thing that would kill off a dominant economic system, but it has and it will. The reason, automation eviscerates the center. And just like a person cannot live without a digestive tract, capitalism cannot survive without a middle class. People see that capitalism is failing, at least intuitively. Right now people are focused on a number of things that they claim are destroying capitalism. However, they are focused on symptoms or phantom causes, not on the actual rot at the heart of the tree. The Right screams regulations, minimum wages and health care spell the end of the system, and we will be left with socialism or communism. To a certain extent, they are correct; we will have to turn to a form of socialism if we continue on this path, but not for any of the reasons they claim. The Left, on the other hand, blames income disparity, greedy business tycoons and mega-banks for the downfall. Again, as with the Right, they have some correct points, especially where greed is concerned. But again, they miss the forest for the trees. Not that the individual trees are unimportant, they are, but the larger picture is being ignored. And, as I stated before, the root problem is automation. But why is it such a problem? The reason is simple, automation destroys the low-education, focused skill, high paying jobs, that built the system. It destroys the jobs that are central to making things. And these jobs, not professional positions are central to a strong capitalist economy. There are certain realities to the professional world. We only need a certain number of doctors and lawyers and other professionals. For example, unless we deliberately infect people so they are sick more, or change the system to require all people to be needing a lawyer at all times in their lives, there is a saturation point to these jobs. They are population ratio jobs. You only need a set number of these people to serve a set number of members of society at large. Similarly, there are only a certain number of teachers that were need, because, again, it is a population ratio profession. Even at the most generous staffing levels, you only need about one teacher to every 15 full time students. That's a lot of teachers, but overall, it isn't an overwhelming number, and it is completely driven by a limited resource, namely, the number of people seeking education. Almost every profession is similar, architects, engineers, even bankers are limited by the number of people who will seek their services. The only profession that I would say is exempt from this would be scientists, because, there is always far more to explore than there are people to explore it. However, this is also a self-limiting profession in another way; only a certain percentage of the population has the inherent talent to excel in the sciences. And honestly, that limitation also applies to the other professions as well. Only a certain number of people have the skills for law, or design or teaching. Yes, you can teach some of that, but, honestly, there is a need for aptitude as well. And I would like to note, aptitude is not equivalent to intelligence. A person could be brilliant, but if they cannot deliver a good oration and handle themselves in a debate, they are not going to make it in law or politics. It just won't happen. Similarly, as we see over and over in our current crop of politicians, you don't really need to be smart to be elected, you just need a great stump speech and a powerful delivery of that speech. However, manufacturing jobs are not a limited field, at least not in the same way as the professions. And by manufacturing, I am including all types of making, from a baker, to a carpenter, to an auto assembly line worker. These jobs are demand driven. The more cakes, the more buildings and the more cars people want, the more people will be employed in those professions. On a side note, this is why most companies created planned obsolescence, to make sure that people kept buying. It is also why "in" colors, and other fashion and styles change, it keeps demand high. But to return to the point, making is typically a focused skill, instead of one requiring extensive and wide ranging education. Further, any needed education in making is typically done through an apprenticeship. There are schools that have stepped in with vocational education, but often these are six month to two year programs. In the traditional apprenticeship, you didn't even have to pay for your education, you got paid to learn. Although the pay was certainly lower than it would be for a journeyman, it still was income during the education process. Further, these jobs were typically high paying, often even higher paying than professional positions. My uncle, who was a licensed engineer, educated at Perdue, left engineering and became a pipe-fitter, because he made significantly more money at it. After he made the switch, he was able to pay off his mortgage in 7 years, instead of the 20 more that it would have taken before. He also found it to be more satisfying work, but that is another topic for another time. For now I will just say, often people engaged in making things have a very high level of satisfaction and pride, because they see the product of their labor. So in the end, in a workforce with a large manufacturing component, you get a lot of people employed at high paying jobs, without needing years of expensive education. Further, these jobs can be done by almost anyone who gets the necessary training. My uncle always said that he could pull anyone off the streets and make them an excellent pipe-fitter in six months if they put their mind to it. And with the wages of a pipe-fitter, they could have a nice house, a nice car and send their kids to college, if the kids wanted that. And even with all those expenses, they could put aside enough for a very nice retirement. However, automation has wiped out a vast majority of these jobs, and is on track to obliterate even more in the coming years. Already, they have developed 3D printing technology to build simple houses. How much longer will it be before they can 3D print skyscrapers? And when they do, what will happen to the carpenters, steel workers, concrete guys and bricklayers? They will go the way of the assembly line worker. And pushing this is the inevitable drive to maximize profits. If you don't have to pay wages, insurance, unemployment, and taxes on thousands of employees, and can replace them with robots, or printers, or other machinery, you save yourself a fortune. Of course, the equipment costs a lot of money at the outset, but that is a one time expenditure, and further, it can be depreciated, saving even more money when tax time rolls around. Not only is this good for the bottom line, it is actually a mandate of the capitalist system. Failing to maximize shareholders' profits is at best dereliction of duty, at worst, possibly a criminal fraud. Regardless, the economics require the companies to lower overhead and increase profit. And we have seen it over and over. There are virtually no receptionists left in the American corporation, and increasingly all basic customer service calls are handled by automated systems. Grocery stores rely more and more on self-service checkout lanes. Assembly lines use robots. Its even creeping into the professions. Fifty years ago, the average architectural firm had a couple of dozen draftsmen (and yes, they were almost all men at that time) cranking out detail after detail, by hand on Mylar. Then came AutoCAD, and those two dozen could be replaced by six, because the details could be cut and pasted from one drawing to another, no effort required. Now, Revit is reducing the six to three, and further, with the internet, those three can be in India, just as easily as in the US. Pretty soon, given how BIM is evolving, the architect will be able to click a set of menu options, design the building and instantly produce a set of CDs without a single other person needed: one step production. And with that, what jobs will there be for architectural interns, job captains or technicians, or any other employee beyond possibly an accountant to manage the books? And really, with Quickbooks, is that even needed? And this is how capitalism dies, not with a bang, going out in some sort of proletariat conflagration, but with a whimper of disappearing jobs, with no hope of employment for the vast percentage of people. So, the Right is correct, in their minds, by saying all that will save it is for labor to become so cheap that it actually doesn't make sense to automate the jobs. They don't acknowledge the actual problem, and I doubt they consciously recognize it, but intuitively, they understand this. However, what they fail to understand is that if everyone is receiving poverty wages, no one will be able to buy anything. And since this model depends on demand, it enters a death spiral. For certain, the captains of industry will get even more fabulously wealthy, at least until the bottom drops out. At the end of this death spiral is a sad fact, either the world embraces a radical socialism, where almost everyone in the bottom 2/3's of society is on the Dole, or we accept that we will unleash a string of violent revolutions. People who are starving, and who have no hope, will overthrow a government, and kill everyone who has the things they want. Then, a small faction gets the power and the money, and the cycle repeats. Over and over, into eternity. France had this happen for about a hundred years; Revolution, brief prosperity, disenfranchisement, discord, Revolution. Only an embrace of a socialistic ideology and two world wars completely broke this cycle. Had those two things not happened, France would likely be as unstable today as many of the countries in South America. The Left also sees some of what is going on, that the big banks and CEO greed are driving the bus over the cliff. They also recognize that income disparity is really impacting the demand based economy. But they are focused on the symptom, not the underlying disease. They want to institute policies that redistribute the wealth and level the playing field somewhat. However, just like the Right, all this does is delay the inevitable. Sure there will be a short term spike in demand, as people have more disposable money, but that increased demand will produce money that is used to increase automation. The construction company is suddenly awash in capital, so what will they do? They'll buy that really cool concrete printer that they couldn't afford last year. And suddenly, an entire concrete crew is out of work. That crew's prosperity is gone and they stop buying. This is repeated over and over in company after company. And then demand sinks. And once again, we are back to the point where it is either almost universal Welfare, or revolution. But what about education? Can't we just retrain these people for new jobs? Teach them a profession? Well, that puts us back to the beginning of this paper. Professional jobs are based on populations; it isn't a demand system, unless you create artificial demand. Therefore, you will quickly get saturation. We are already seeing this in Law and in Higher Education. There are far more law school graduates and PhD's than there ever will be available positions. And suddenly a Juris Doctor is handing you your McDonalds. So what is the solution. Either we have to develop a post-capitalist economic model that is not based in employment, and maybe not even in money, or we have to limit automation. Although the first option is, in my mind at least, the more realistic long term solution, the reality is, no one is going to go along with that strategy, at least not now. We can't even get the powers that be to move on climate change, which is as close to a certainty as science can ever get. We will never get people to move on some sort of change to the fundamental economic structure of the entire world. So that leaves limiting automation. I read a science fiction story by Jack Chalker where they had a law that stated, "unless the job is too hazardous to be undertaken by humans, no job that can be done by a person is allowed to be given over to a robot." Although some would argue that this, for all intents and purposes, kills off capitalism, in actuality, it is the only way to save the system. At least save it until we can actually come up with something better. Why? Because it would re-insert the high paying, low education but focused skilled jobs back into the economy. If assembly lines and construction sites were required to be using people instead of machines, we would have a much more robust middle class. and with a robust middle class, demand for the products of manufacturing would go up. And this would lead to further expansion of job opportunities, which would in turn lead to more demand. I realize that this would also lead to more resource consumption, more pollution and more environmental devastation, so this is not really a long term solution. As I said before, it would only be a bridge to a different system. But it would give us the time to come to terms with some realities that we don't want to face right now. However, in the end, it would give us what we need most, time to solve the problem.